Well, that's interesting. I'm interested in this because I am in the, perhaps unusual, position of knowing exactly how much 'visceral fat' I have. I have taken part twice (last year and in 2009) in a 'body composition study' (in Ireland - to build up a database of body composition for the country) and in the follow-up last year they were able to give a much more detailed report than the first time (which was pretty good). They must have got a new DEXA scanner. So, according to that I have 347g of visceral fat. It didn't seem much to me when I read it, I mean it's less than a pound (about as much as the butter I currently have in the fridge) but these severely obese people only have - variously - 2-3 times what I have. I'm female, 164 cm tall, weight 58 kg and have a BMI of about 21 and a total body fat of about 23% now I think; in 2009 I weighed 51 kg and had a BMI of 19 and a body fat percentage of 17.5%. Since then I've aged 9 years, gone through menopause and also a fair bit of emotional stress, even trauma. That's very interesting Jay, to me 800g sounds quite a lot. 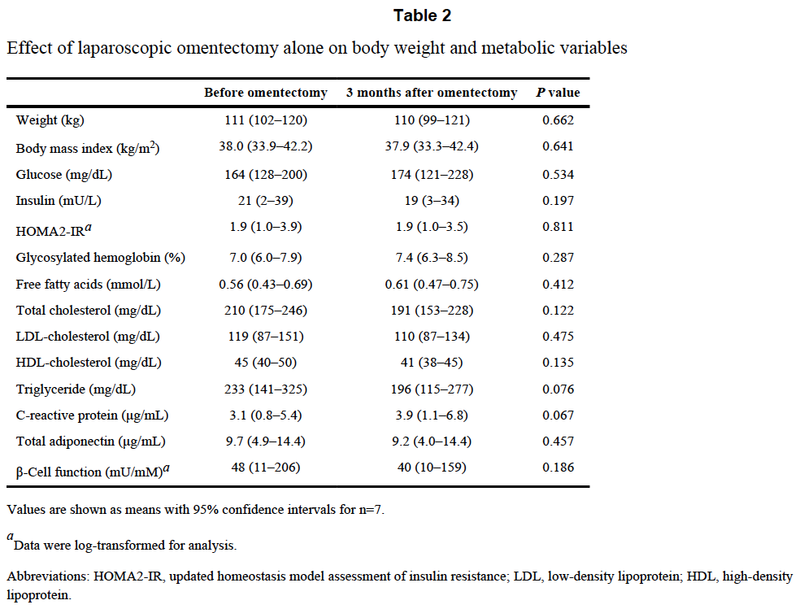 It makes me wonder what % of the omental fat the surgeons actually managed to remove. 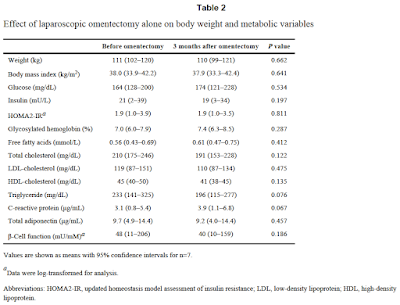 There are a stack of rodent/canine studies which show omentectomy in an excellent light for improving insulin sensitivity. But of course you can be a lot more gung-ho in de-omentalising a lab rat than you can a human surgical volunteer. 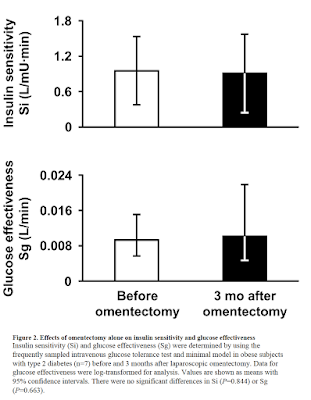 Never the less I find it very hard to conceive how removing a chunk of the body's most insulin sensitive fat cells, which should act as a glucose sump, can improve overall insulin sensitivity... It's odd and only plausible if the FFAs from the omentum really do impact hepatic insulin sensitivity. That seems remarkably difficult to demonstrate. This flurry of posts on visceral fat has this layman wondering a lot of things. For example, if VAT is more insulin sensitive, does this mean it is the first adipose tissue to accumulate lipid in response to whatever packs more fat into adipocytes? If not, I'd think there is some other property of the adipose tissue which determines that. Also, musn't there be a base level of VAT that everyone carries around? Even my tall, slender, energetic, athletic, non-low-carb,15-year-old grandson must have some VAT which may one day accumulate mass. I'm also reminded of some posts Kindke wrote a few years ago about pre-adipocyte differentation into full-blow adipocytes and the related epigenetics. I assume he was discussing subcutaneous adipocytes, but I wonder if the same principle, or maybe something different, applies to visercal adipocytes. Bob, Peter: is it not also the mythical 'brown fat' that has futile cycles and generates heat? Since hearing about it in biochemistry class 35 years ago (and ever since wishing I'd been paying proper attention at the time) always thought I had that. I've always been skinny and noticed that if I overeat - or overdrink - I (used to - less reliable now as I've got older/menopausal) have a kind of internal furnace that kicks in in the middle of the night and could sometimes wake me up with the amount of heat I was putting out. Creeping fat is a specific type of mesenteric fat that wraps around the intestines in IBD. It's evil as well, as it appears in conjunction with active inflammation, and because obesity and inflammation etc. One supposition is for it to be a response to bacterial translocation, as it is rich in macrophage and il-6 (also anti-inflammatory cytokines). Maybe it is a function of a corrupted healing process... I've seen it mentioned in a couple of places that hyperinsulinemia is an independent protective marker for remission of disease activity, interestingly. Jay, alcohol even in moderate amounts will do that a couple of hours after consumption. Conventional wisdom has it that this is due to various hormones going back to normal levels. Could also be down to increased permeability of intestinal linings allowing bacterial toxins into the bloodstream, or due to the body trying to burn off these nasty carbs. Does sugar have the same effect on you? Bob, the clamped glucose uptake tracer studies say exactly this. It should, theoretically, develop the largest adipocytes soonest so leak FFAs first. That’s the point of the lipophobes. Except finding the data is not proving easy, hence the IL-6 was so welcome in Konrad’s study! Jay, that's also UCP1 driven plus oxidising NADH via the glycerophospahe shuttle (mtG3Pdh) generates 4 pumped protons’ worth of heat. About sugar I wouldn't know - haven't really eaten enough of it in years to notice any effect!